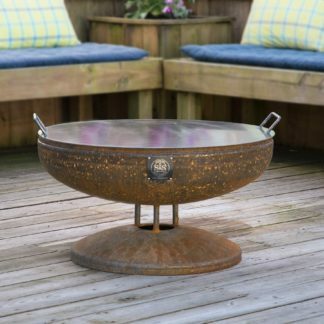 Our fire pit snuffer lids are one of our best-selling products and for good reason. When the fire pit is not in use, the snuffer acts as a tabletop for drinks and food, but also keeps water and such out of the pit. When the snuffer is placed on the fire pit after use, it guarantees you won’t burn down the neighborhood. Consider it a win-win for everyone. Our snuffers are built from solid plate steel and will suffocate a fire within about five minutes. When used after a fire, it works to prevent the spread of ash and embers by creating an effective seal around the pit. The snuffer will arrive in its natural raw steel look, but the oxidation process will cause it to form an outside layer of surface rust which will help to protect the internal steel. This process is supposed to happen, and will make the snuffer match the fire pit, which goes through the same process. To give your snuffer more of a tabletop look, you can paint it with a high-temperature paint. This will form a bonding layer between the steel and the outside elements. If you decide to do this, it will need to be repainted about once a year. Most of our customers enjoy the look of the natural steel and just allow the steel to age on its own. Two reasons: One, no one wants to get woken up in the middle of the night and told to go check on the fire and two, who wouldn’t like to turn their fire pit, when not in use, into a table top surface where you can place your beer, coffee or whatever on when not using it for a fire. My wife prefers to use it for plant pots or food, but I like the drink idea myself. Safety is also a concern when leaving fires smoldering. Our heavy-duty lids extinguish the fire, so you don’t have to worry about it reigniting. The snuffer also acts as a protectant against the elements, keeping rain and snow out. Many companies sell hinged models, but the gap in the middle defeats the purpose of having a cover in the first place, as the elements are going to seep in and over time any moving parts will eventually fail, not our motto. After you pick up one of our fire pits, you really should get a snuffer. Snuffers and cooking grates are our most popular accessories, because they are useful, safer and expand the horizon on what you do with your fire pit. The snuffers we make are solid US steel and come with thick welded handles for easy placement. They are also, durable and difficult for children to move, which is ultimately better for safety. 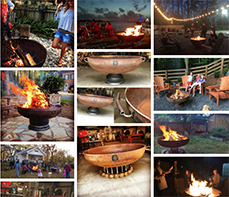 Many of our customers buy the fire pit and snuffer at the same time, using PayPal financing. PayPal offers six months interest-free financing, and it only takes a few steps to complete the process. We also offer credit and debit card options.